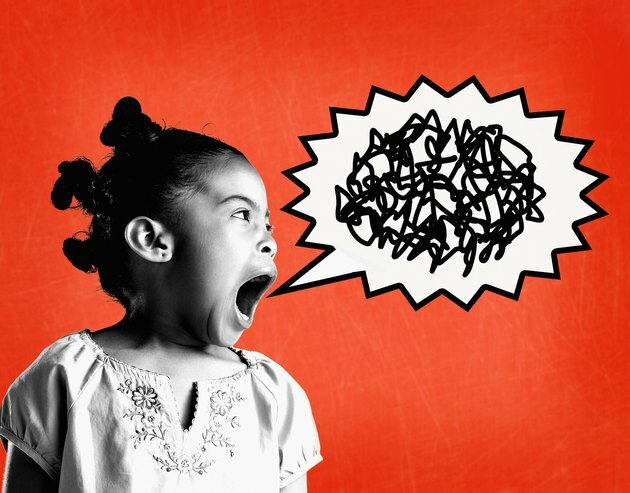 Angry behavior in children can appear as physical aggression -- such as hitting, spitting, biting, throwing objects -- or may be expressed verbally through yelling, cursing or lashing out. If your child is acting out due to anger, it is helpful to consider that anger itself is a normal and healthy feeling. However, the behaviors it can lead to can be harmful and inappropriate. Teaching your child strategies to de-escalate anger can help him learn to cope with his feelings and calm himself down in a proactive manner. Positive and healthy self-esteem helps control anger, according to "Tips for Coping With Your Angry Behavior," a 2007 PsychCentral article written by psychologist Michael Ashworth. Point out your child’s positive attributes and get her involved in activities she is good at. If she feels in control and good about herself, she will be less likely to become angry. When she does become angry she will feel more competent to deal with what angers her in an appropriate manner, as anger often is fed by feelings of self-doubt, fear and lack of control. Healthychildren.org suggests teaching your child how to calm down in response to angry feelings. Activities that can help decrease stressful feelings include deep breathing, listening to relaxing music, counting to 10, exercise, blowing bubbles and squeezing clay. Make a list of activities your child thinks will calm him down when he feels angry. You can make a box to house items that he may need to calm himself. Let your child know about bodily changes that can occur in response to stress and anger, such as heavy breathing, a burning face, clenched fists or tightened muscles. Teach your child that when she feels these changes in her body and as a result wants to stomp her feet, throw something, or do whatever she usually does in response to anger, her urges are not unlike those of many other people. Have her think about the problem or situation that made her angry and then come up with a plan to either solve it or deal with it. KidsHealth encourages kids to talk to a trustworthy friend to help pop the anger bubble. Children may also seek a parent, sibling, teacher or counselor to help process feelings of anger. Let your child know about resources -- especially those available in the place where he is likely to need help dealing with anger. For example, if your child gets angry at school due to peer conflict, encourage him to talk to his teacher or guidance counselor. If he is having issues with an older brother, maybe his father can give him helpful advice and support in dealing with sibling conflict. If your child doesn’t want to share his thoughts about his anger with others, get him a journal in which to write it down so he can process his emotions.